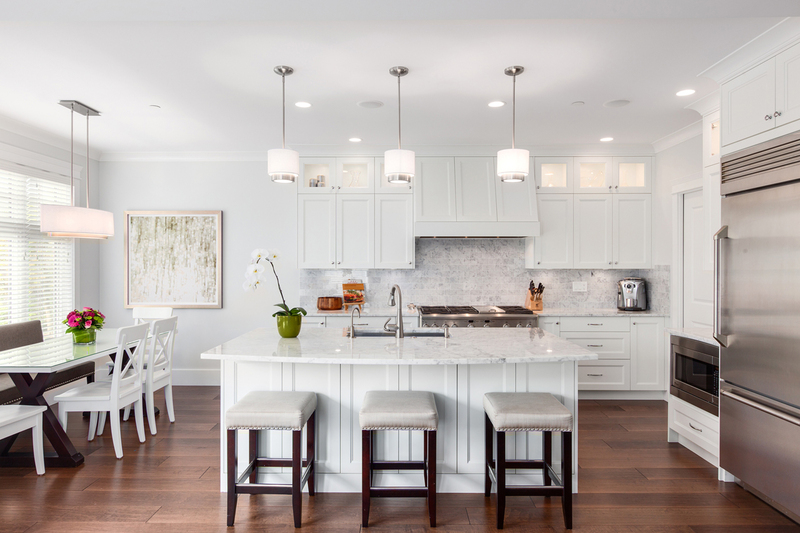 There are few things in interior design that are truly timeless, but white kitchen cabinets are one of those classics that never goes out of style. The versatility of the plain white blank canvas gives you freedom to design the other elements of your kitchen in various styles, and with different colors. Things like backsplashes, floor tiles, lighting, and of course countertops are given much more freedom to express themselves without the kitchen becoming a little too busy. 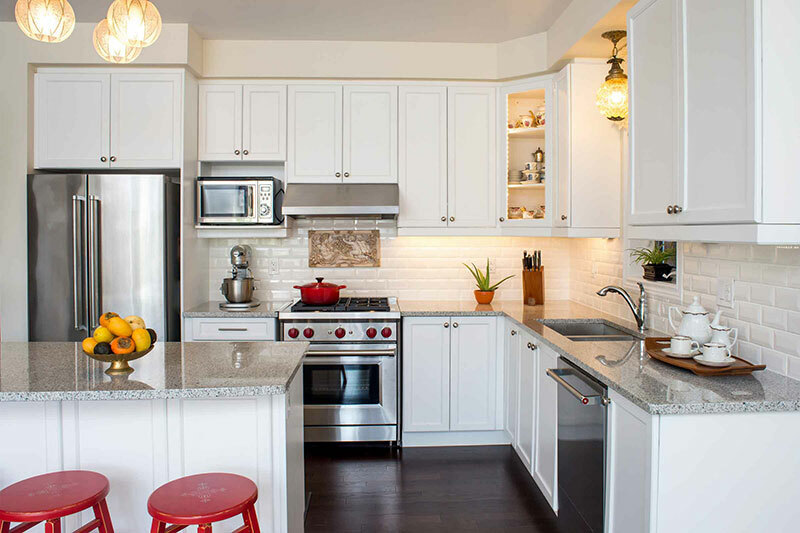 Let’s take a look at some of the best combinations of materials and colors that complement white kitchen cabinets. 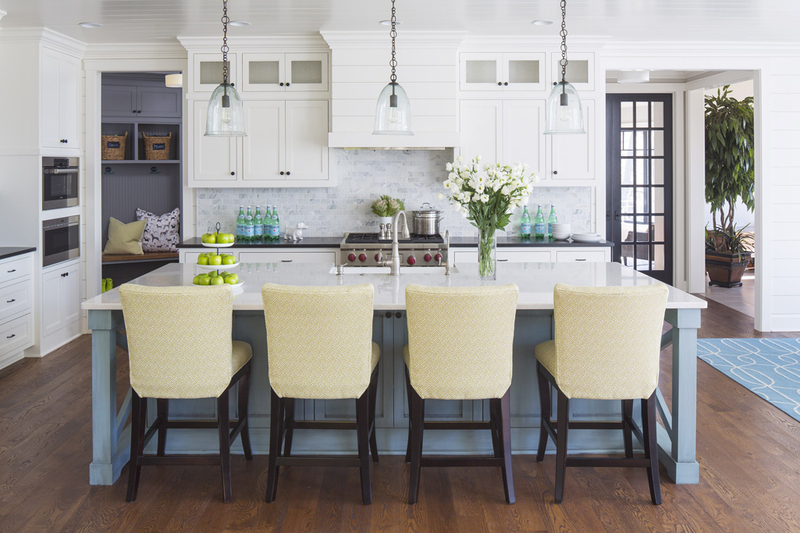 Let’s start with the most influential part of any kitchens decor – the countertops. 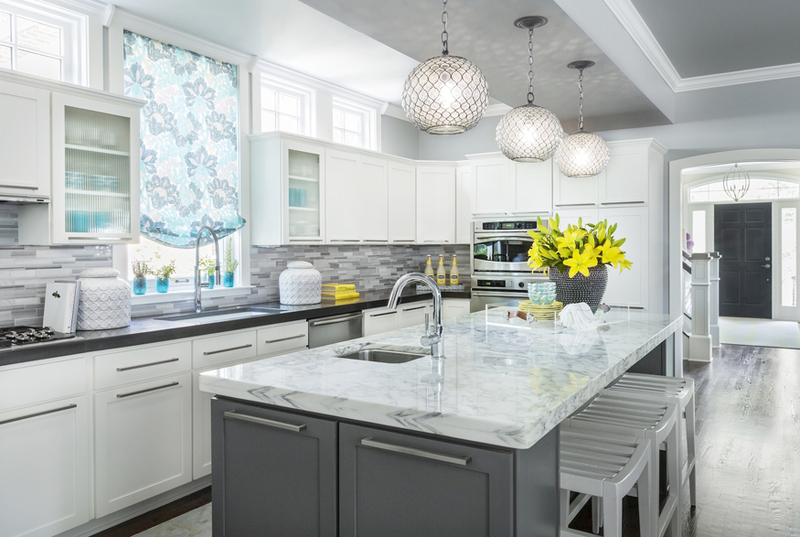 When you have white kitchen cabinets, your countertops are going to be the focus of the room; they are going to be drawn into the spotlight regardless of the material they are made from. 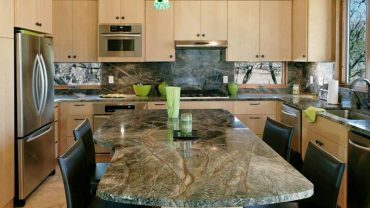 Granite is one of the most popular materials for kitchen countertops that the world has ever seen. The incredible durability combined with the immense beauty of the material is an almost perfect combination. However, granite has some competition from two other hardworking stone materials – marble and soapstone. Both marble and soapstone are just as durable as granite and are equally as beautiful in their magnificent ways. You can find all of these three types of stone countertop in a variety of different colors and patterns. Listing them all in this article would take far too long. So we are going to talk in generalities a little bit. 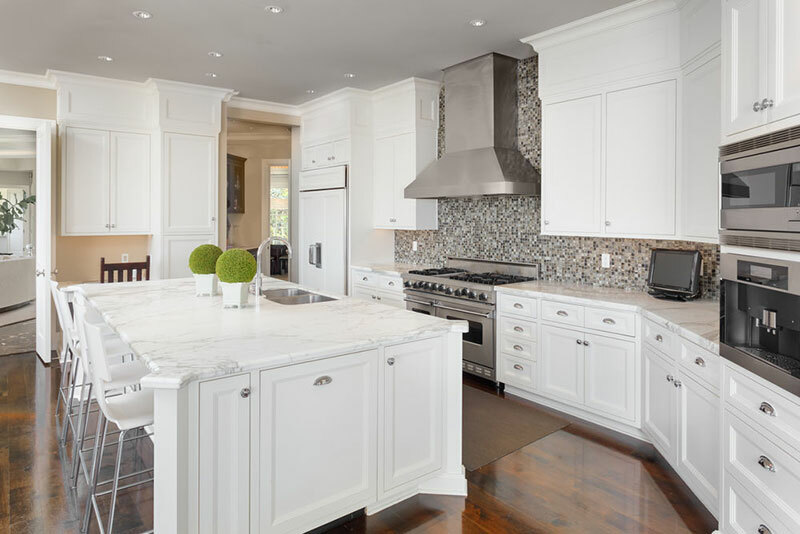 When you combine white kitchen cabinets with a white or very light colored stone countertop (be it marble, granite, or soapstone) your kitchen becomes a serene continuously flowing room. It has a sense of oneness and an almost Zen-like appearance. 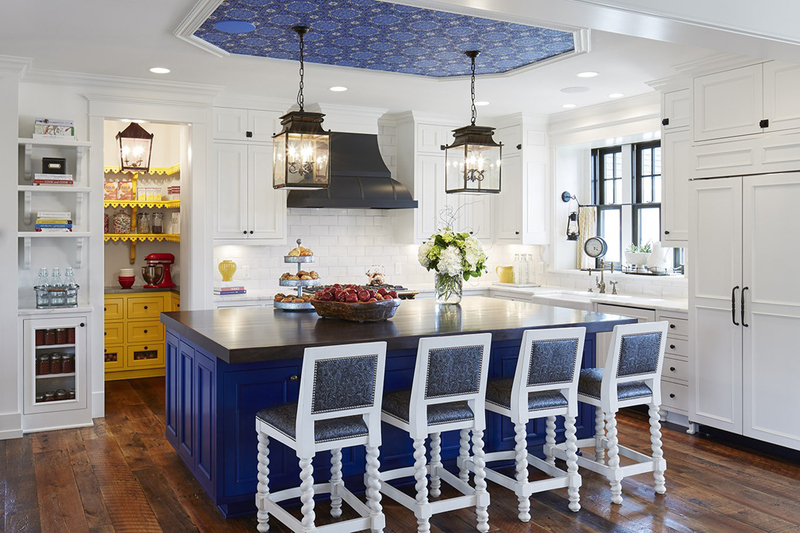 This can be a little bit too much for some people, and could be seen as bland – but it can always be offset by other pieces of kitchen décor to add a little color and vibrancy. 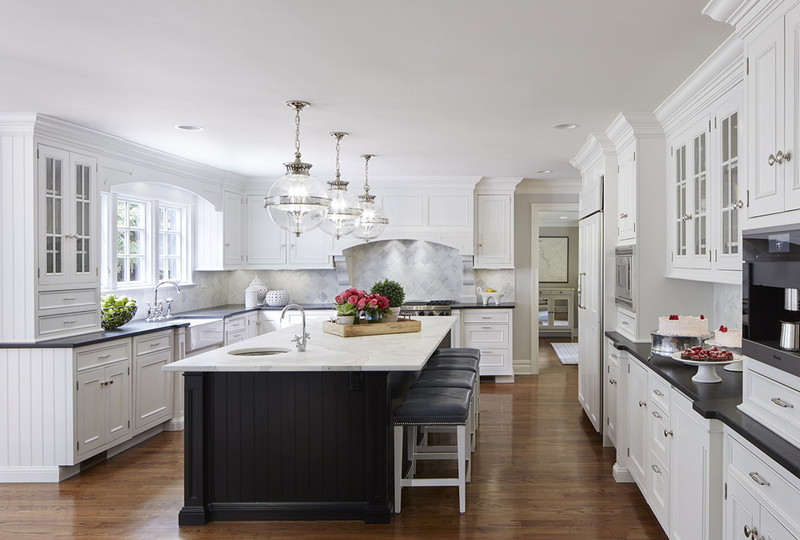 When you have a more moderate color such as a dark gray or a black stone countertop the room takes on a very different feeling to it altogether. 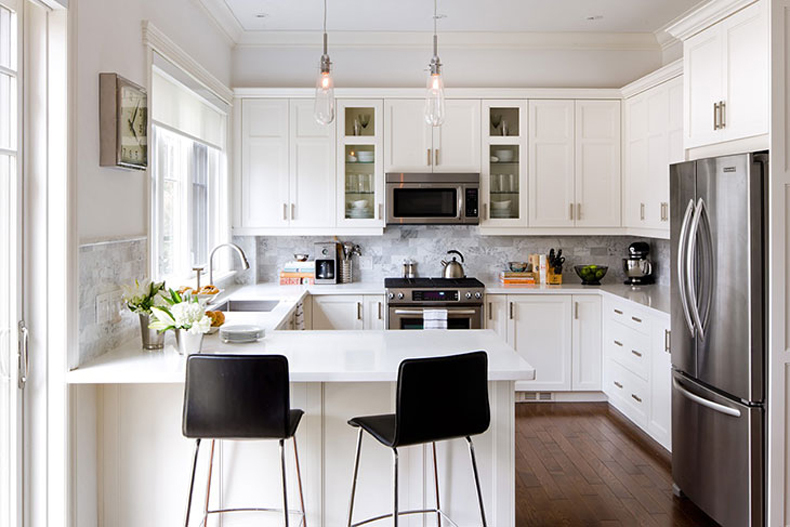 The dark countertops contrast starkly against the pure brilliant white of the cabinets. It can be quite a monochromatic effect in some cases that will not be to everyone’s tastes, so it may also need livening up with a little bit of color in other areas of the rooms décor. Many stones (mainly granite or marble) are known for defining features that make them some of the most beautiful materials on the planet. These could be little bright flashes of brightly colored minerals dotted around the stone, or they could be long winding thick mineral veins that dominate the appearance of the stone. (or your stone could just be a single color and have no features at all). 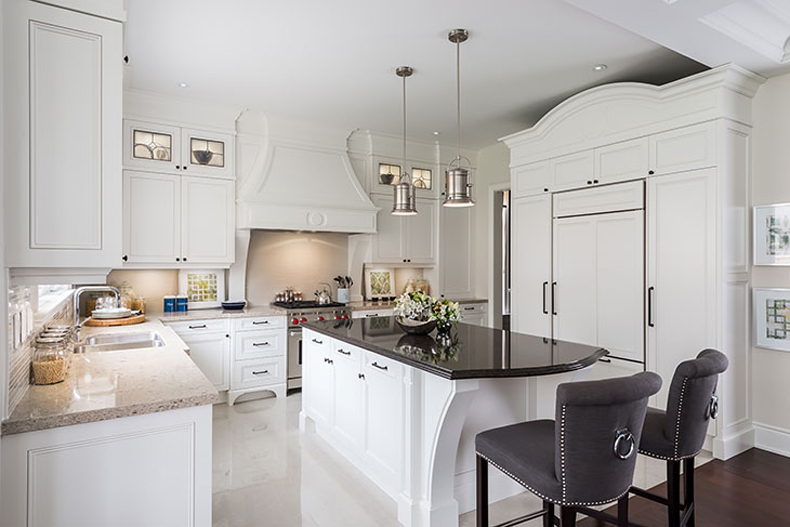 Whatever the features your stone has, combining it with white kitchen cabinets will bring that feature to the forefront of the room. The blank white canvas directs the eye to any little bit of interesting color the rooms décor has. When the primary color in the room is found in these minerals – the result can be spectacular. 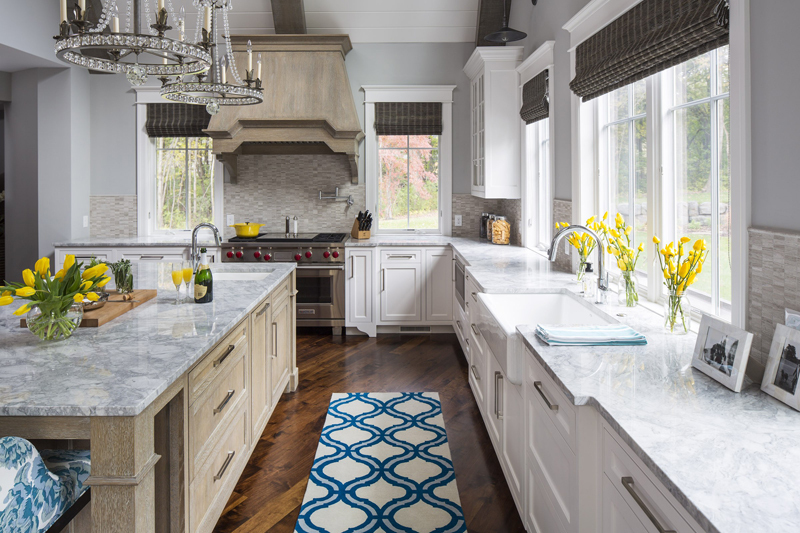 While granite, marble, and soapstone may be some of the most durable materials used for countertops – this does not mean there are not alternatives that are worthy of consideration. Wood, for example, is a common choice. Despite not being as durable as stone, it is more than up to the task of being used as a countertop – and it is much, much cheaper too. 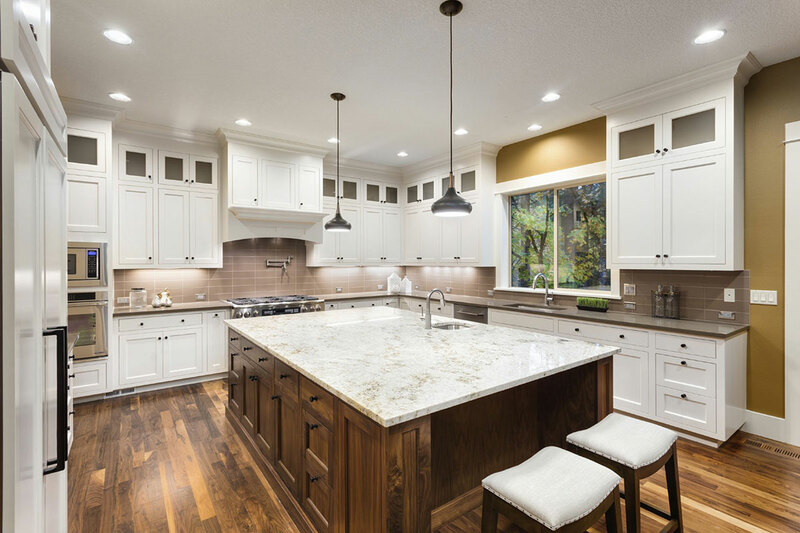 The combination of white kitchen cabinets with wood countertops is a beautiful effect that can be presented in a variety of different ways depending on the intensity and color of the stain that is used. Dark stained woods will have a similar contrasting effect to the dark stones we discussed above. But they do not have any little bits of color in them to try and make the effect less monochromatic. The most popular color combination for wood countertops and white cabinets is undoubtedly a light wood stain color (or even no stain at all). This is a good middle ground between the two extremes of light and dark we discussed earlier. 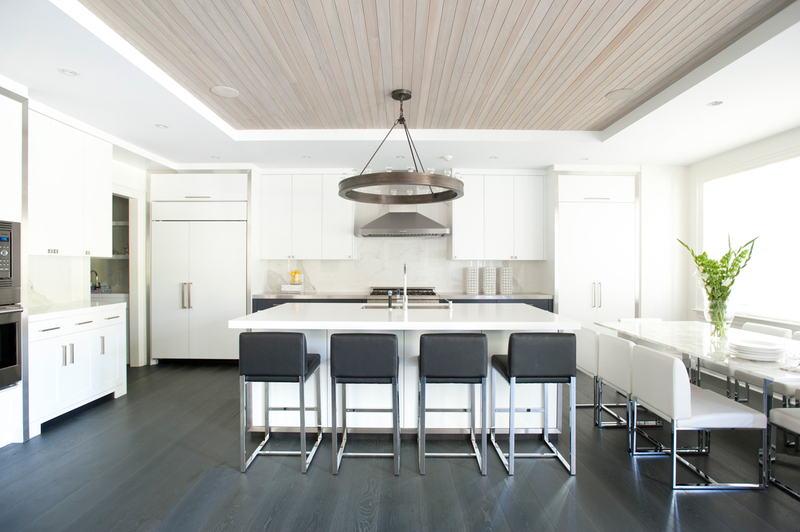 The wood is a clear attention grabbing feature of the room, but it is not overpowering. It seems to blend and meld with the room, while still being reasonably prominent. It’s a stunning combination that only uses two colors – which means there is still room for adventurous color combinations in the rest of the rooms décor if you so wish. 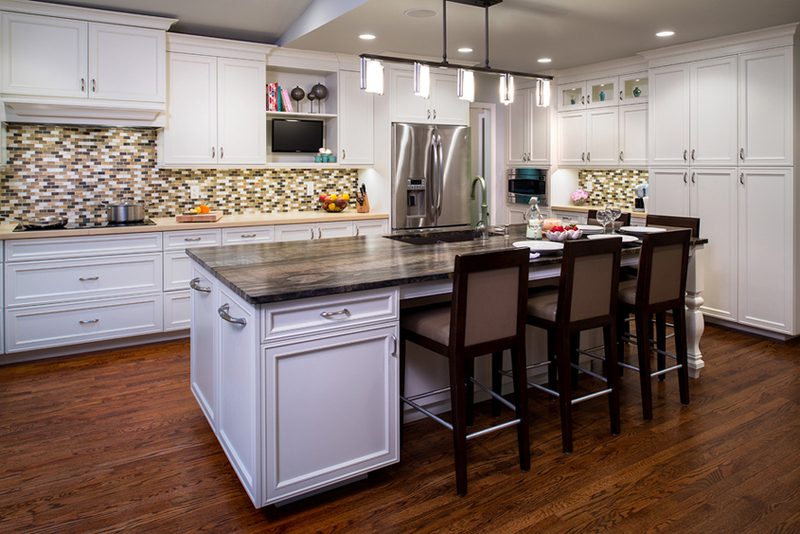 Granite, marble, soapstone and wood are all materials that have been used in countertops for decades now. But with time comes innovation, and innovation has brought a new material that is rapidly gaining popularity into the forefront of kitchen design – paper composite. Paper composite is an almost rock hard compressed bundle of paper that is usually made from recycled materials. Despite the name, it looks nothing like paper, and most people will be incredibly surprised to find out that is what your countertops are made from. Paper composite countertops can be found in all kinds of colors as the color is artificially added as a dye when the countertops are being formed. The same color rules apply as we have spoken about for the other materials in this article, but there are however two main differences that are unique to paper composite countertops. Primarily they are available in very vibrant and wild colors, as well as more traditional ones. So if you are looking to make a bold colorful statement with your kitchen, this could be the material you are looking for. Something like a dazzling ultramarine blue or a strong racing car red can be incredibly dramatic and dominate when set against the pure white cabinets. The other difference is that paper composite countertops are incredibly uniform in their appearance. The other materials on this page are all natural materials, which means they will have inherent variations within them that create a nonuniform appearance – even if the color itself is reasonably uniform. The highly uniform and artificial nature of paper composite countertops can be a good thing or a bad thing depending on your personal tastes. 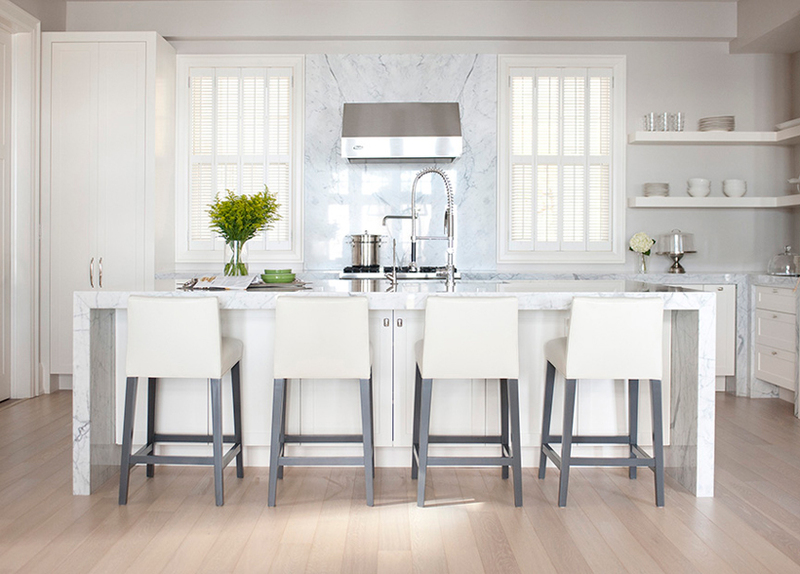 White kitchen cabinets already have an overwhelming sense of plain continuity to them due to the inherent canvas like properties of the color white. When this is combined with the artificial appearance of paper composite countertops – the kitchen can almost look a little “toy like” in some ways. It looks a little too artificial for many people’s tastes, and this effect should be taken into account. (It is worth mentioning here that some people love this effect and it can be used well if you are creating something that has a specific theme – for example something like a 60s diner or a retro kitchen). 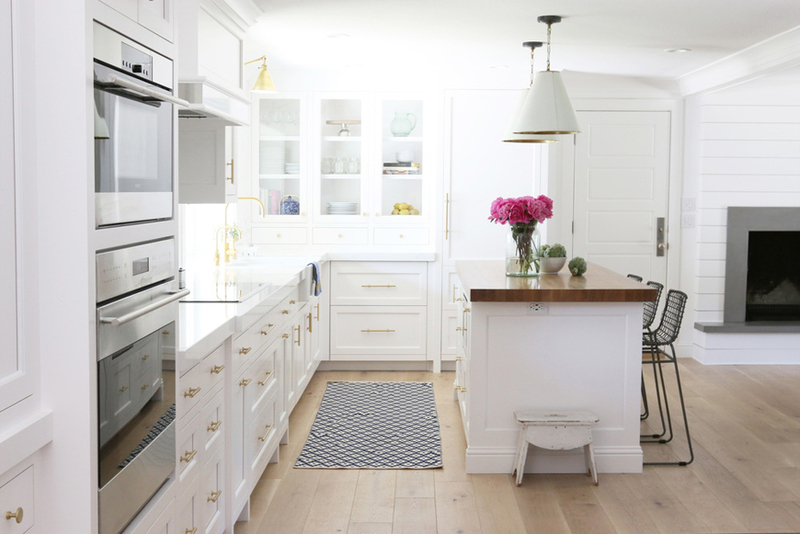 The second most dominating thing in a kitchen’s décor is undoubtedly the flooring. 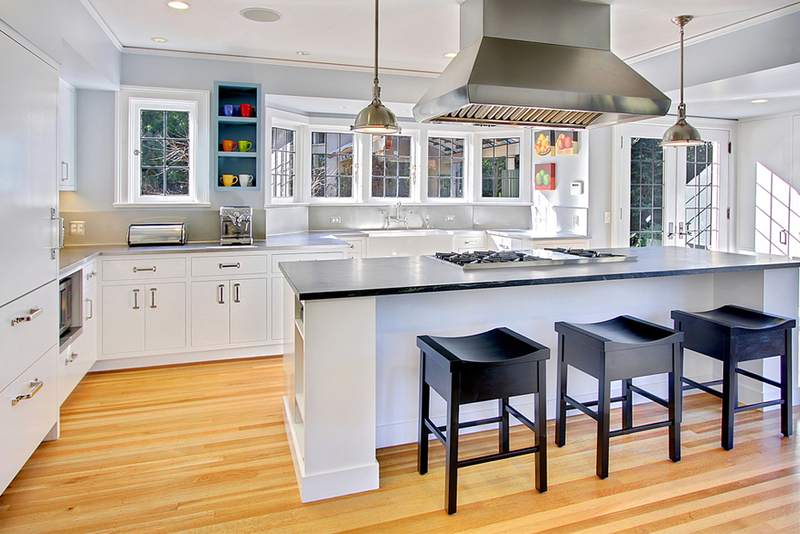 When someone first steps into any kitchen the countertops draw the eye, and it then naturally falls to the flooring. 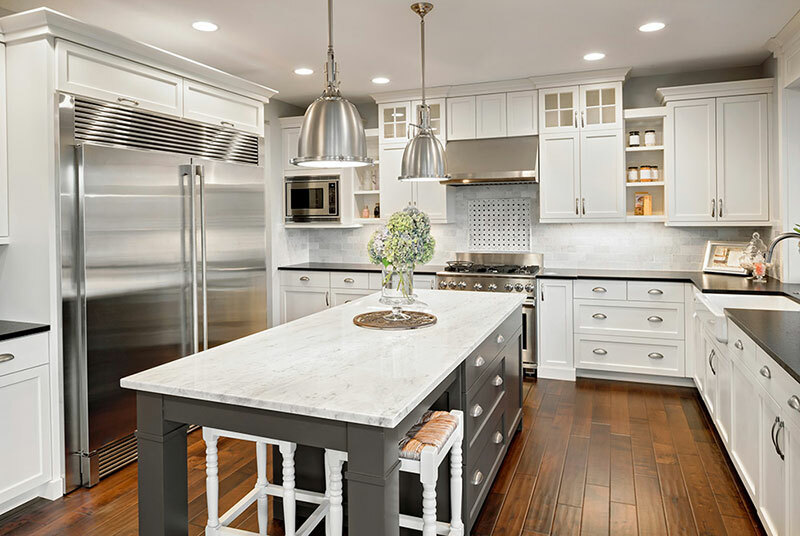 While white kitchen cabinets are going to give your room a reasonably blank canvas – how prominent your flooring appears depends largely on what kind of countertops you have decided upon. Hardwood flooring is something that many people aspire to have in their home – and what better place for it than the kitchen. The natural beauty of the wood combined with its incredibly durable nature makes it a perfect choice of material. 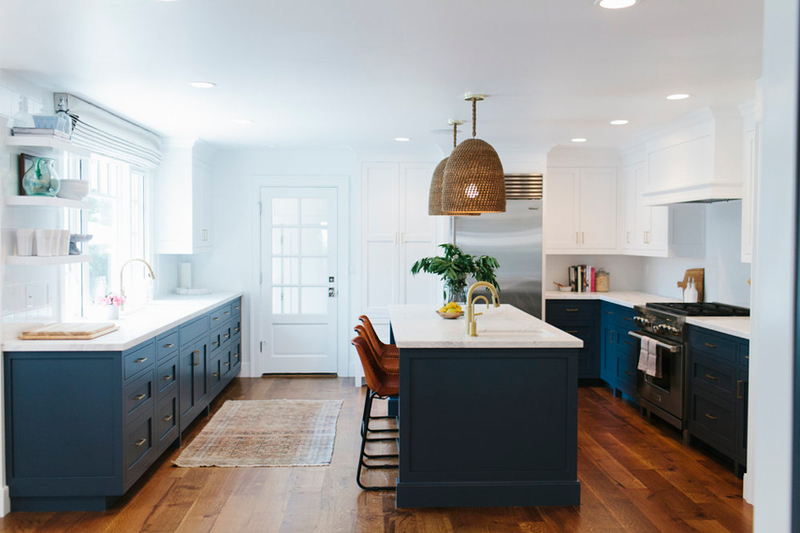 It can be stained in a variety of colors and used in different ways, but a combination we like particularly is a hardwood floor combined with wood countertops of a similar color, which are then pronounced by the clean the white cabinets. 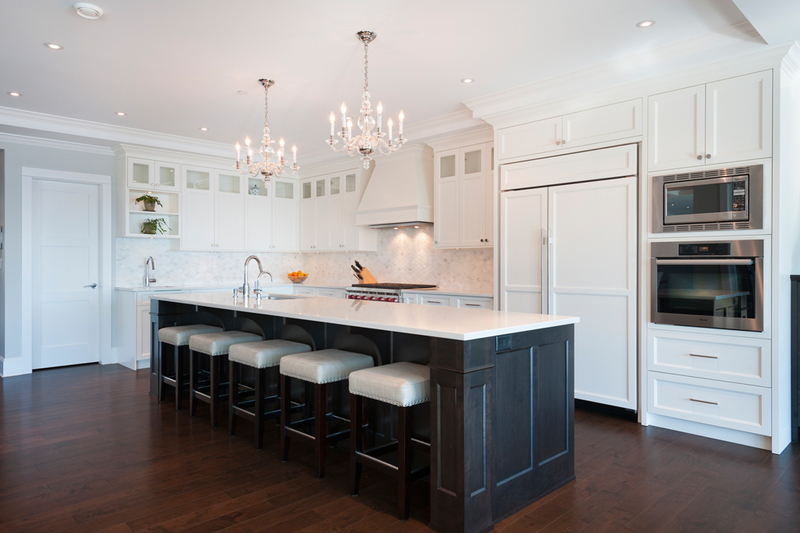 The wood countertops and hardwood flooring complement each other beautifully. The room feels incredibly “intentionally” designed, it creates the kind of feel you get from looking at kitchens in catalogs. 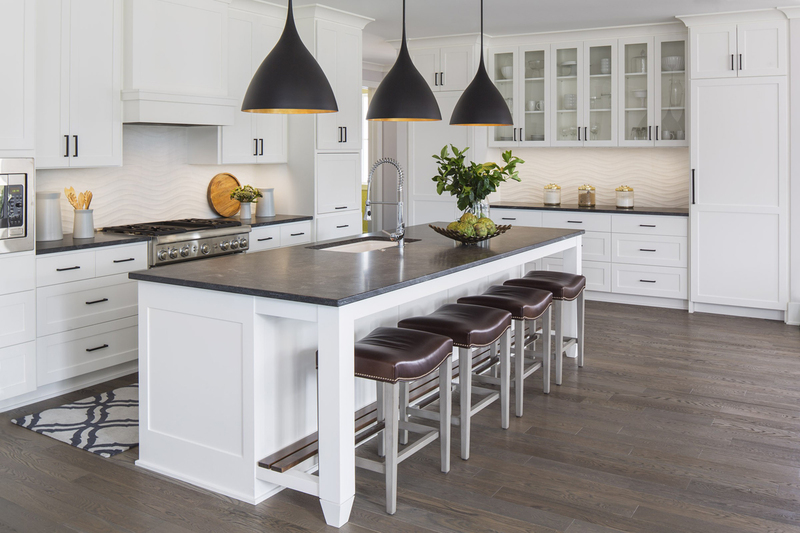 Hardwood flooring can also combine beautifully with any of the natural stone countertops we mentioned in the first section of this article – especially if they are reasonably plain and predominantly white. Then when entering the room for the first time the eye is drawn to the only piece of color in the room – the beautiful natural hardwood flooring. Hardwood flooring doesn’t particularly work well in our opinion with paper composite countertops because of their clinical artificial nature being emphasized by the clean bright white cabinets. It is a combination that feels slightly unnatural or even forced in some cases. It’s not just hardwood flooring that follows theses rules. Laminate flooring has a very similar feel when combined with white kitchen cabinets. Despite looking reasonably different to wood flooring, the overall effect, when combined with the white cabinets, is the same. Bamboo flooring is a natural material that has only really been used in the past decade or so, but its natural insulating properties and its incredible durability have made it a quickly rising star in the world of home décor. The same rules and comments we have made about hardwood flooring can also apply to bamboo flooring by and large. However, if you wish to move away from the natural materials (or faux-natural materials) of hardwood, laminate, and bamboo, then vinyl and tile flooring can also be used to great effect. 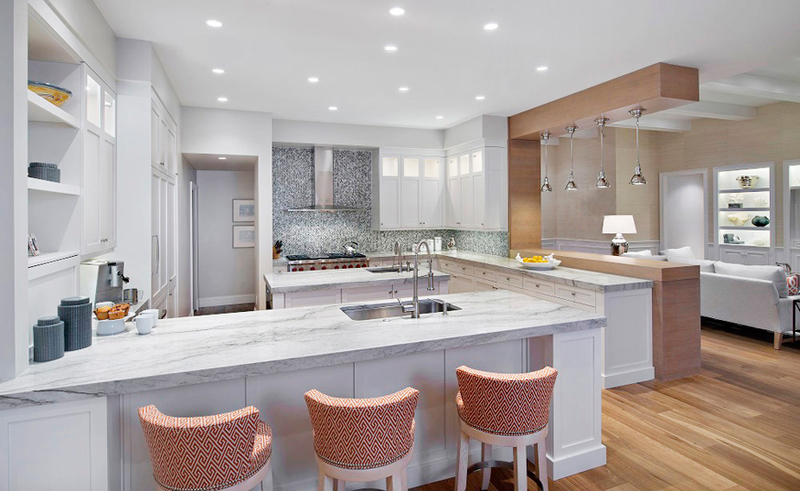 We love the combination of white kitchen cabinets with a lightly colored polished stone countertop (marble or granite) and a lightly colored tile flooring. 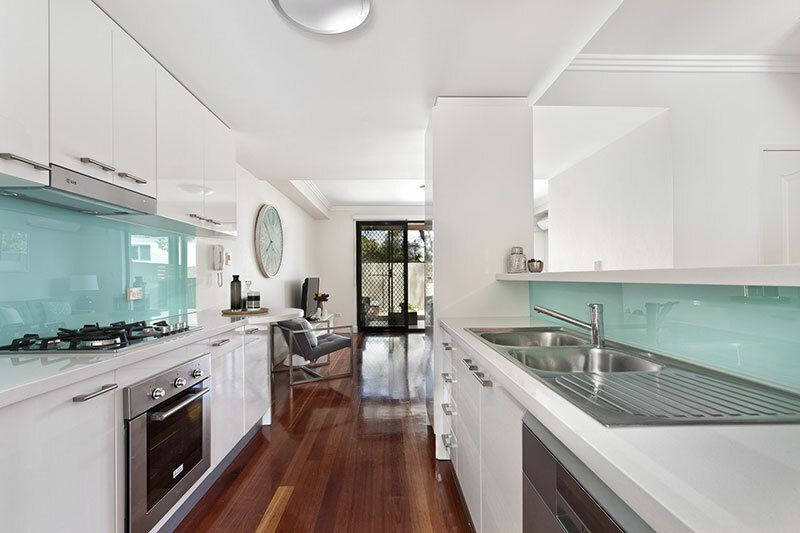 The whole kitchen from top to bottom becomes one continuous thing of beauty that is both calm and peaceful. Ideally either your countertops or tiles will be darker than white, things like cream and very light gray can work well here. 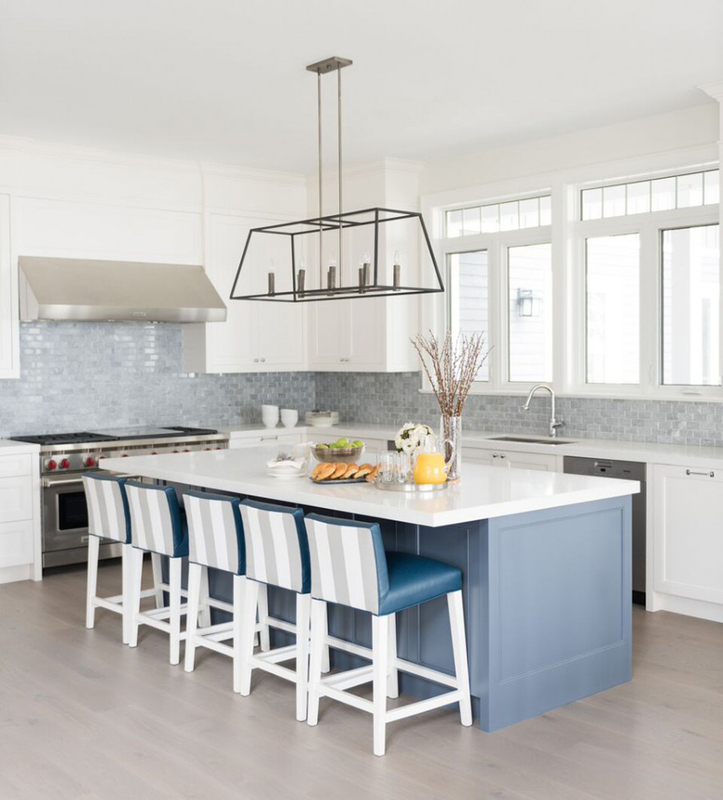 But at minimum be sure that at either your countertops or tiles have some color – white countertops and white cabinets and white flooring is too much white for anyone’s tastes. Vinyl flooring is something that should be avoided with white kitchen cabinets if at all possible. It is widely regarded as the most unattractive form of flooring. While it is cheap, durable, and serves its purpose well – it’s not something you ideally want to bring attention to. 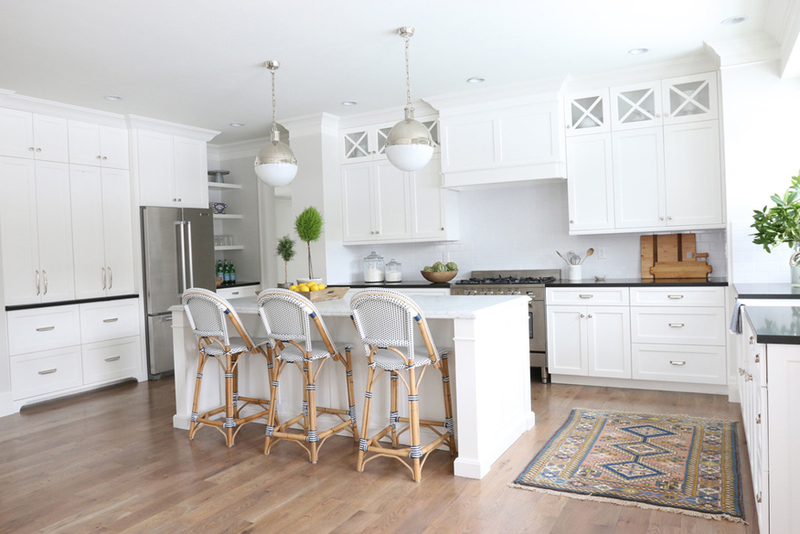 The plain white of the cabinets sends the eye naturally looking for some detail and color, and unfortunately, for people with vinyl floors – that usually means they look at the flooring. 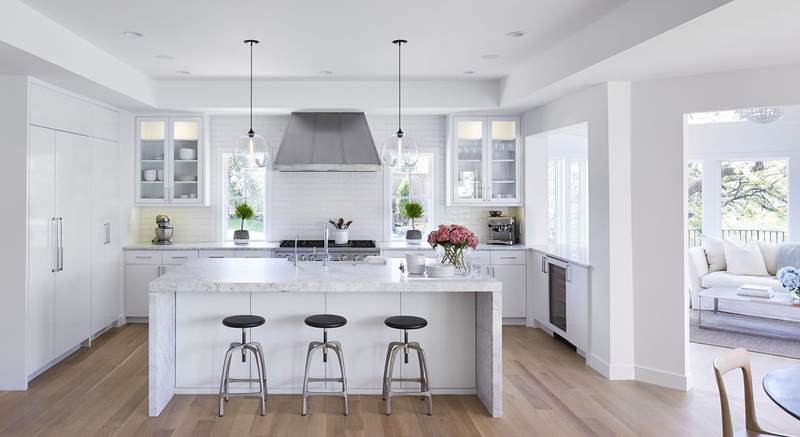 This can be mitigated slightly if you have a dominating color for your countertops, but ideally, your flooring should be made of a higher quality material in a kitchen with white cabinets. So now we have discussed the big bold main colors of your room in the countertops and the flooring – it’s time to discuss something that is a little less dominating, but equally as important for the room’s overall décor – The backsplash. 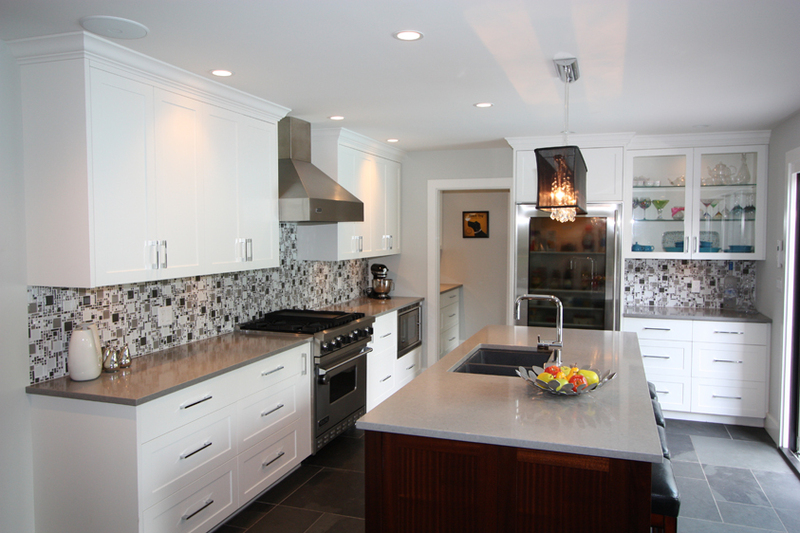 There are two main ways of dealing with a backsplash in a kitchen that has white cabinets. You either try and create a prominent focal point, or you try and blend the room together. If you have granite or marble countertops, using the same material for your backsplash is an excellent way to tie the room together. 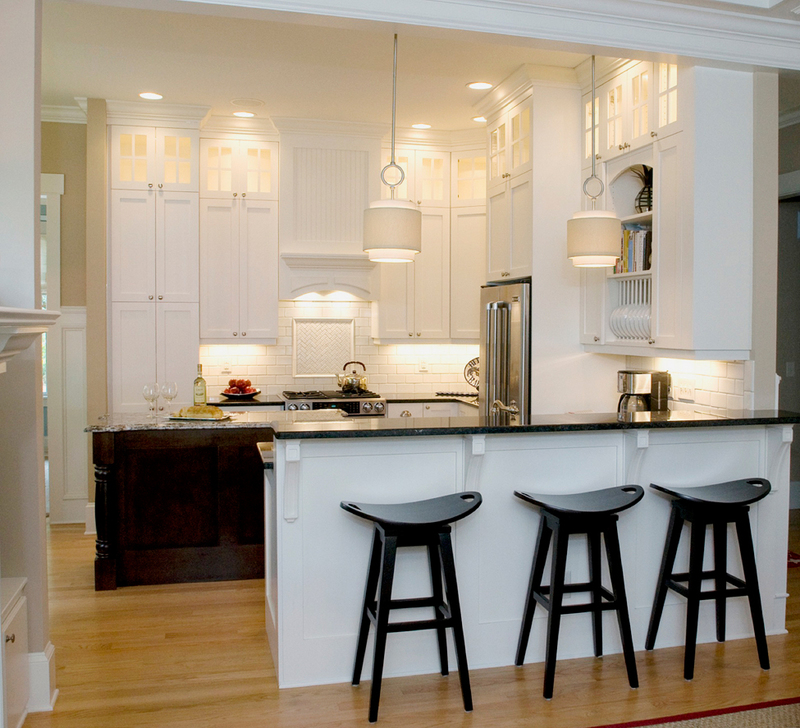 If your countertops are light the effect is a smooth one, and it feels as if countertops and cabinets are almost as one. However, if you have dark countertops and use the same dark material for your backsplash – your cabinets become a little more pronounced in the room. The backsplash has an almost jarring effect on the eyes and creates an immediate and obvious statement that your cabinets and countertops are starkly contrasting. Tile backsplashes can be used to a similar effect (if you have tiled flooring). If you use the same tiles for your backsplash as you have used for your floor the effect has a very “designer” feel to it. It feels like the room has been created with a purpose and gels it together as a single thought out piece of design. But you may want to keep things a little bit subtle. 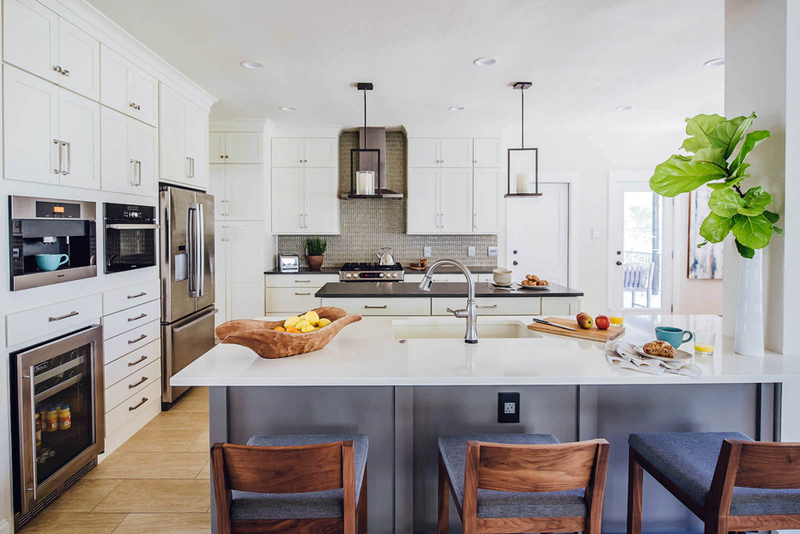 Perhaps your countertops are light, and your floor is light, and perhaps you want to retain the pure feel that is given by the complementary tones of your white cabinets. This is a good time to consider a glass backsplash. A transparent glass backsplash will be nearly invisible when the room is viewed as a whole – but a brushed or smoked glass backsplash can be used to great effect. It’s a subtle way to break up the usually single solid color of the wall – without altering the overall aesthetic of the room too much. 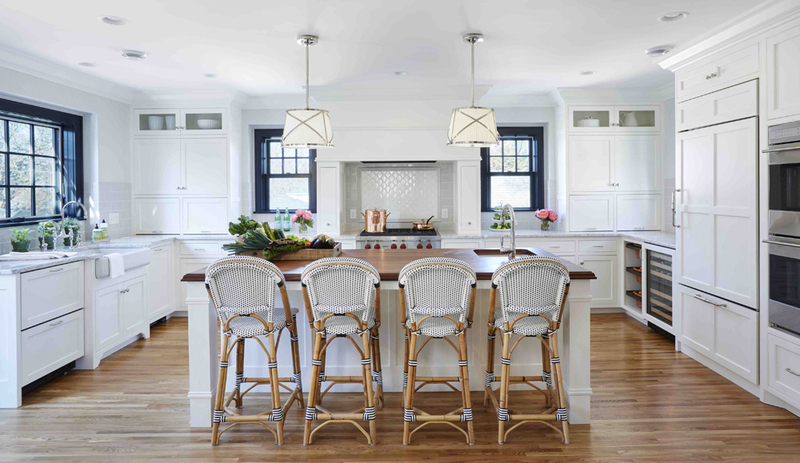 The final section of our guide is one of the most overlooked parts of a kitchen’s décor – the lighting. 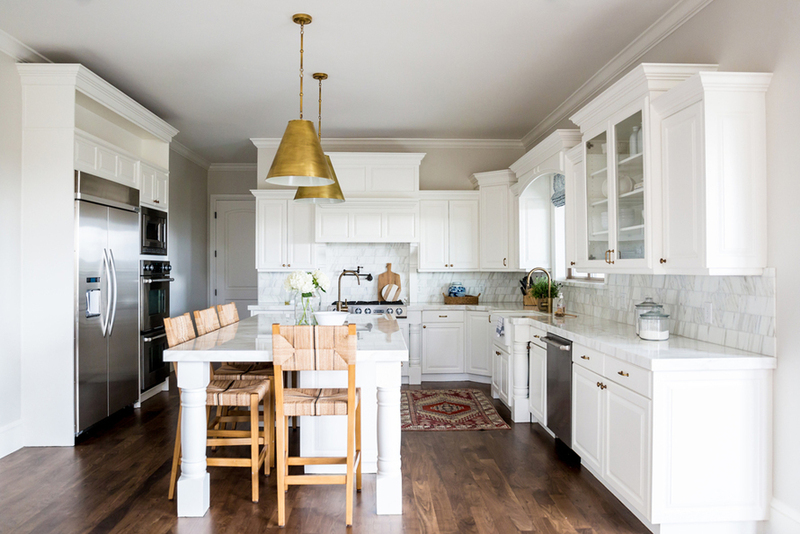 The lighting is usually the only piece of décor in a room that is at the same height (or higher) than the cabinets, and as such, they have a reasonably intimate relationship. 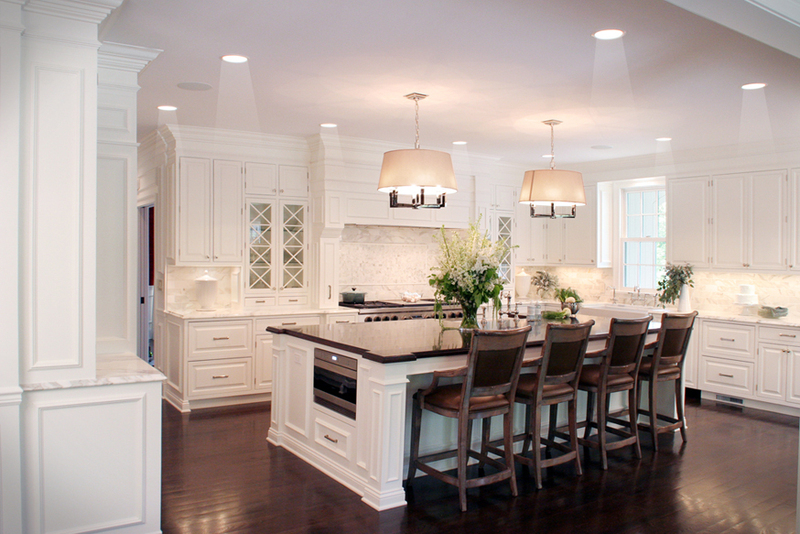 Pendant lighting works particularly well with white kitchen cabinets. 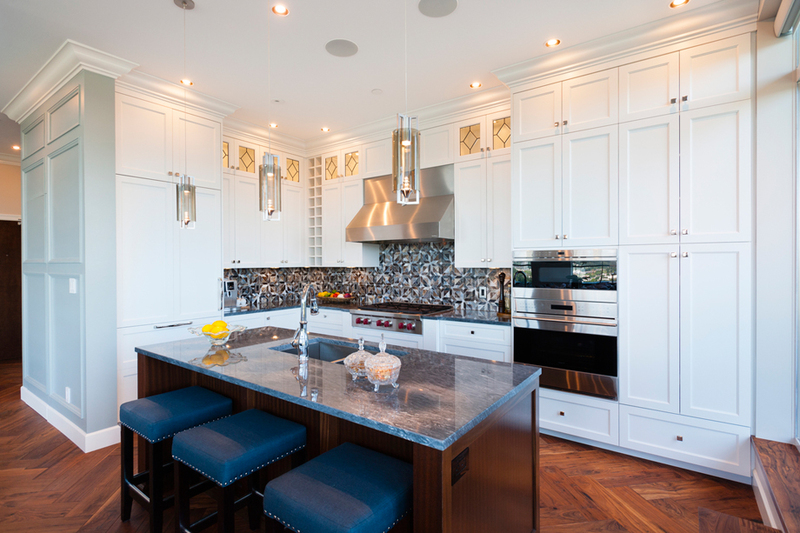 The cabinets become a literal blank canvas for the pendant lighting. This allows you to potentially add a little bit of excitement and color in ways that would not be possible with other darker cabinet colors. 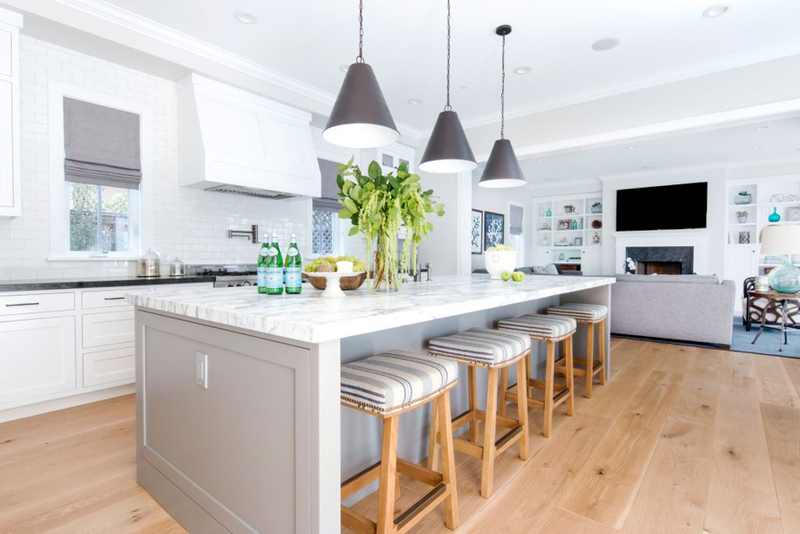 You can find some beautiful pendant lighting designs that can become a focal point of a room when given a chance to dominate the neutral white cabinets. However, if we are talking about focal points of rooms, nothing can compare to a chandelier. 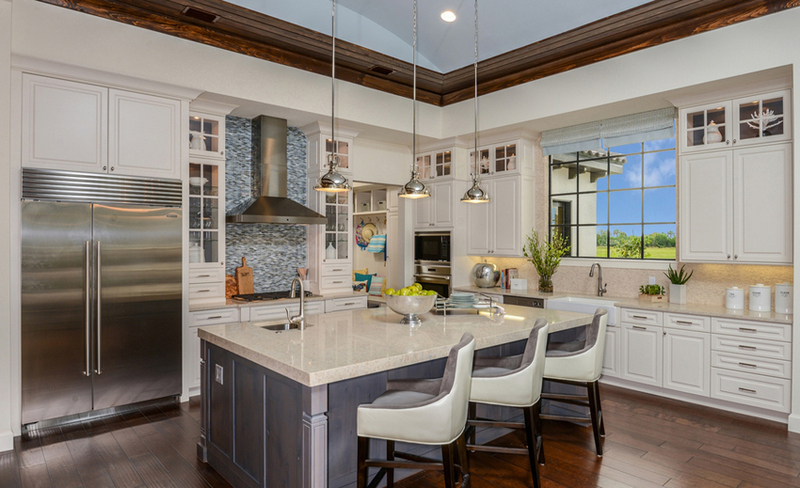 When combined with white kitchen cabinets a chandelier makes the room feel incredibly opulent. The light that reflects off of the crystals will shine various tones of white and blue onto the cabinets – quite literally making them a canvas for light. It is a stunning, soft and gentle complementary combination. In our humble opinion, white cabinets are one of the best (if not the best) colors for a kitchen with a chandelier that you could hope for. However, not everyone wants to make their lighting a focal point of the room. 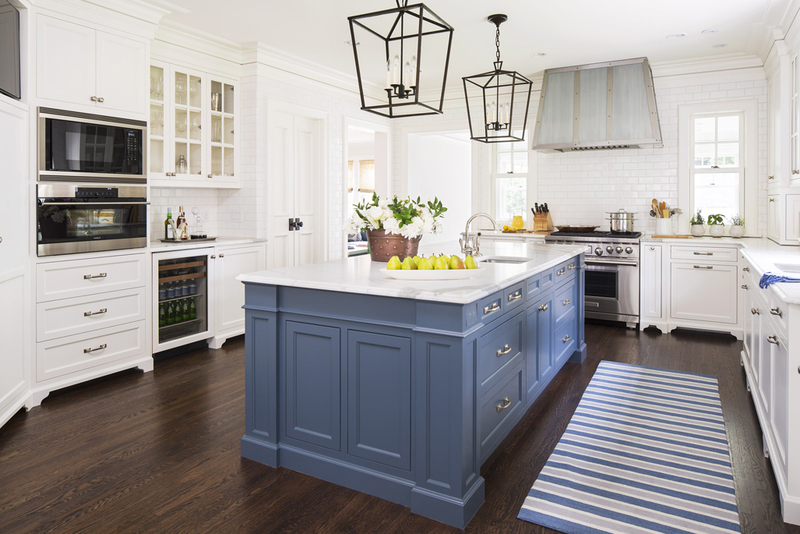 Perhaps you have decided that your flooring and cabinets are going to be the attention grabbers – and you just want something functional that gets the job done. 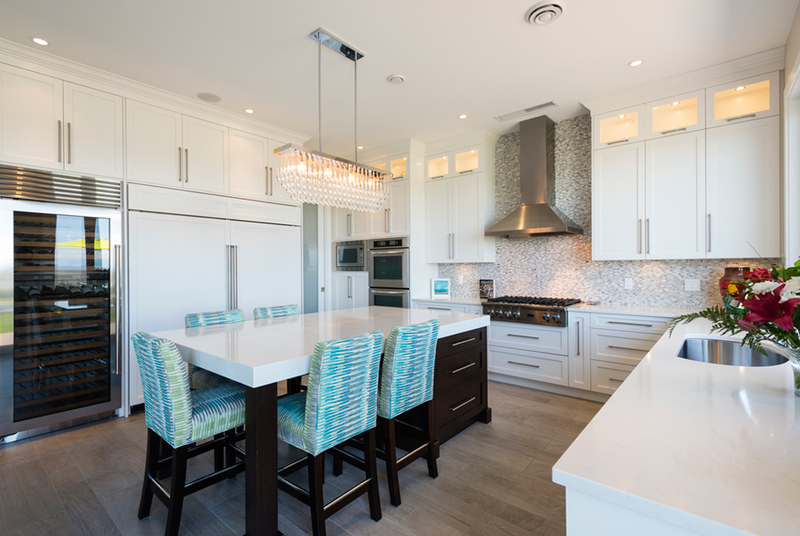 Track lighting and recessed lighting are both ways to light your kitchen without trying to draw attention away from your focal points – Track lighting is usually up so high that it usually goes unnoticed, and recessed lighting by its very definition is hidden. Something that is often overlooked with lighting a kitchen is the actual color of the light bulb. 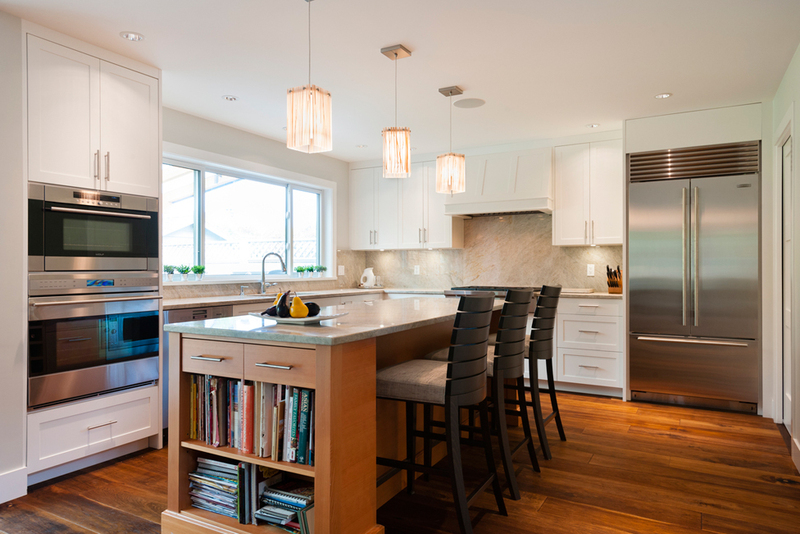 Regardless of the style of lighting you choose, the color of the light bulb is crucial when you are using white cabinets. Because they have no color of their own, the cabinets will adopt the color of the light bulb. 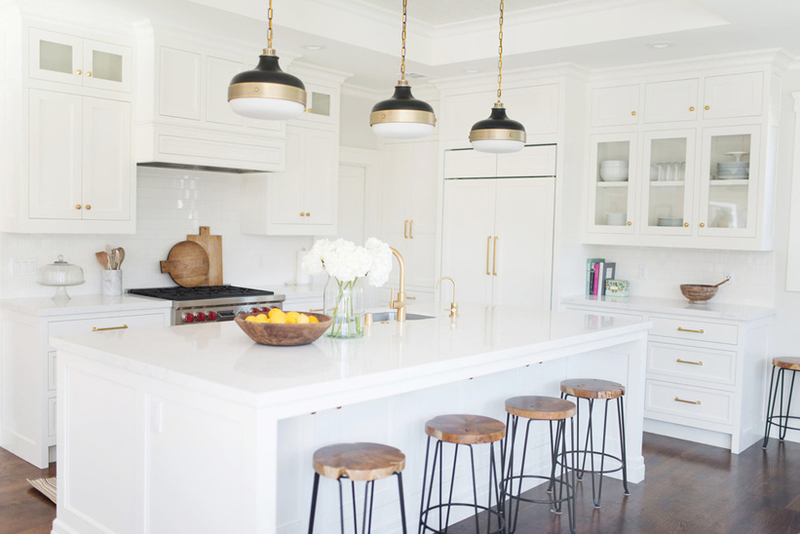 If you choose a very bright white light, the cabinets will seem much more clinical than they are, but if you use a yellower light, it will make the cabinets soften slightly. Bear this in mind when deciding what kind of ambiance you want your room to take on when lit. 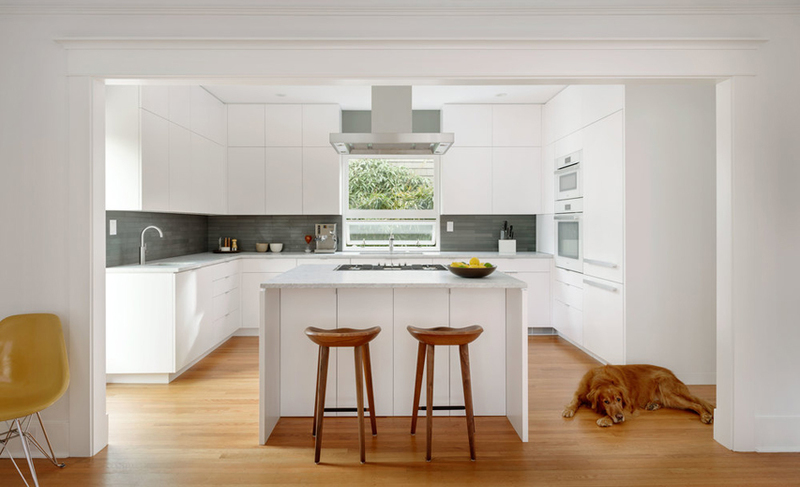 The number 200 of white kitchen design is quite a large one, but that just means there is going to be a lot of variety to be looked at today.